Having a joint replacement surgery? Read below to find out the benefits of aquatic physical therapy following your joint replacement surgery. The pool provides a low-impact environment to minimize pressure on your joints, specifically your new joint. You will be able to move with more ease and less pain when in the water. 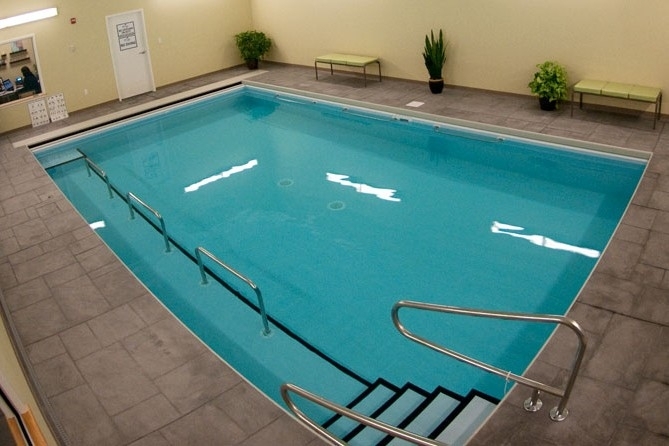 The pool is a place that you will be able to start walking sooner without your cane, crutches or walker. Because of the buoyancy of the water you will be only a portion of your body weight (the percentage of body weight depends on the depth of the water). This will allow you to normalize your walking pattern sooner as you will be assisted by the water and have less pain. Warm pools (92 degrees is the ideal therapeutic temperature) will help relax your muscles and will feel good on your joints. After surgery, your muscles will tighten as a way of guarding and protecting your new joint. You will achieve better movement and range of motion when in the water because your muscles will loosen. After a joint replacement surgery, you will have swelling in the area. The hydrostatic pressure of the water will help reduce this swelling by improving circulation. The water will provide a resistance that will help begin to strengthen your muscles soon after surgery. This is a gentle form of exercise that will feel good! The rest of your body will thank you. After surgery, you go through a period where you are less mobile and you will start using compensatory movement patterns to accommodate your injured body part. because of this, you can develop pain and soreness in other parts of your body. Getting in a warm pool to exercise will help realign your body as well as allow your other parts to take a break from the hard work of recovering from surgery.